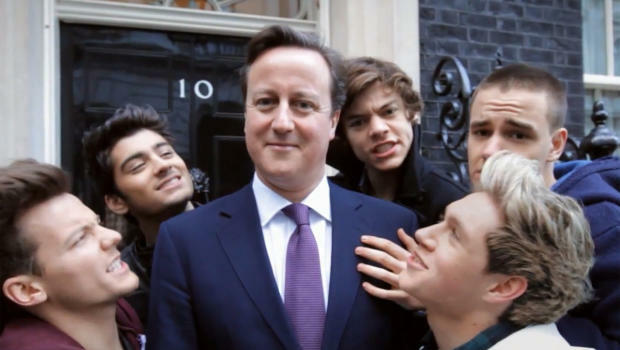 UK Prime Minister stars in One Direction music video. U.K. Prime Minister David Cameron appeared in a One Direction music video which premiered online Wednesday, and it was all for a good cause. The British boy band members are showing off their talents behind the camera with their latest music video for “One Way or Another (Teenage Kicks),” a charity single for Comic Relief. They shot the video in locations ranging from Japan to New York to Africa. “Instead of spending a lot of money on a music video, we decided to make it ourselves while we’re on tour and give the money we save to Comic Relief,” group member Harry Styles said in the video’s opening segment. The song had previously been reported by One Direction Blog as being leaked – much to the fury of bosses at Syco – read full article here.